Victoria Martinez’s delightful account of relatively unknown and obscure facts about the royal families of Europe, An Unusual Journey through Royal History (ISBN: 978-1-935712-45-9), which focuses on the British monarchy, but is by no means restricted to it, makes for relaxing and easy reading. Grounded in personally conducted research, all but one of the 18 essays that comprise the work were originally published on Geraldine Voost’s popular website, Unofficial Royalty website, which partly accounts for their light tone, yet informative nature—they are, in short, far from ephemeral.In An Unusual Journey through Royal History, Martinez covers a wide range of topics, from male circumcision, through royal portraiture, to sewerage systems. Martinez’s lively and whimsical approach entices and tantalizes the reader’s interest and curiosity in aspects of blue-blooded lineage, consideration of which might never before have entered the person’s mind. As Martinez states, “I’m never more satisfied than when I’ve ‘converted’ someone from a passive or disinterested observer of history into an inquisitive and involved participant in the past.” Martinez’s imaginative and empathic insights into the peccadilloes and eccentricities of those of royal lineage bring the past to life in a relaxed, offbeat way that is a far cry from the conventional retelling of the past. In her discussion of how the monarchy has changed over the years, she reveals what she truly thinks regarding its relevance to the modern day. Her background in PR enables her to explore the public face of various European monarchies, as it has evolved over the centuries. Many of the topics that she covers have had wide-ranging implications for the dynasties of yore, and have repercussions that stretch even into today. From the divine healing powers of kings, to such longstanding legislation as the Act of Settlement of 1701 and The Royal Marriages Act of 1772, she shows how the behavior of those in power impacted on all strata of society. Martinez’s lack of bias regarding the religious aspects of history is reflected in her own life, as she is a Protestant who is married to a Catholic. Martinez’s essentially generous and nonjudgmental nature has enabled her to produce a work that is relevant and fascinating, and which should appeal to a wide range of readers, from youngsters seeking escape from what some perceive to be the almost inevitable boredom of the history classroom, through keen followers of the paparazzi, to older adults who love to reminisce about the past. An Unusual Journey through Royal History should prove to be a valuable addition to all school and college libraries, as well as relaxing, yet informative, reading for any private collection. Have you ever wondered about the basic hygiene of your favourite royal? Or, how about their body-piercings? Not to mention their bloodline, which, at one point, royals claimed came directly from Charlemagne, the first Holy Roman Emperor. Certainly their insistence in the past for royals to only marry royals has created a long line of royal successions for each and every monarchy. Did you know, for example, that Queen Elizabeth II is indirectly, or directly, depending on how you look at it, in line of succession to a whole list of other monarchies? If any, or indeed all, of these monarchies were to suddenly run out of hundreds of eligible candidates, Britain’s Queen could step up and take these thrones. It makes you wonder what her ancestor, Queen Victoria, would think; perhaps another British Royal Empire in the making? Queen Victoria would certainly think that it was about time, being one who, with great dignity, believed that her ancestry, and that of her descendents, dated back to Israel’s ancient monarchy, in particular, King David. In fact, there are those who believe that the British people were descended from one of the Ten Lost Tribes of Israel. That probably explains the royal obsession with the Jewish ritual of circumcision. An Unusual Journey Through Royal History is exactly what its title suggests. It is a compilation of historical royal trivia: noteworthy, perhaps, definitely rare and, at times, inconceivable. It certainly makes the study of royal history an interesting quagmire, a Pandora’s Box, of the strange, the unusual and, perhaps, sometimes the sordid anomalies of very public lives. Victoria Martinez is a royalist. More important, though, she is an historian of royalty. Her freelance public relations employment allows her to travel extensively and to research the history that fascinates her: royal history. She is a regular columnist for the online site, Unofficial Royalty (http://www.unofficialroyalty.com) and Time Travel-Britain.com. Her articles also appear in print journals such as The European Royal History Journal, Royalty Digest Quarterly and The Duke and Duchess of Windsor Society Quarterly. 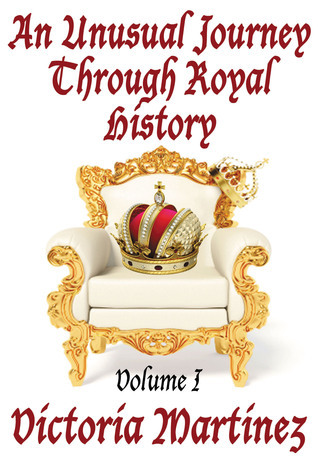 An Unusual Journey Through Royal History is a compilation of Martinez’s essays and articles which have appeared in various online and print publications. Martinez writes in an inviting style, with interesting descriptions and commentary, coupled with lots of well-researched historical facts. An Unusual Journey Through Royal History is a fascinating collection of royal trivia, well written, well researched and well presented. Well done! An Unusual Journey Through Royal History is highly recommended by award-winning author and Allbooks reviewer, Emily-Jane Hills Orford, Allbooks Reviews. Interesting tidbits about royalty, written as short essays. A fun read, full of weird facts. Great, fun, interesting read! Lots of things I didn't know about the royals and how the royal machine works. Enjoyed it and am looking forward to discussing it with my book club. Interesting. Particularly enjoyed the chapter on tattooed monarchs. A quick, liight read. Victoria Martinez’s delightful account of relatively unknown and obscure facts about the royal families of Europe, An Unusual Journey through Royal History, which focuses on the British monarchy, but is by no means restricted to it, makes for relaxing and easy reading. Grounded in personally conducted research, all but one of the 18 essays that comprise the work were originally published on Geraldine Voost’s popular website, Unofficial Royalty website, which partly accounts for their light tone, yet informative nature—they are, in short, far from ephemeral.In An Unusual Journey through Royal History, Martinez covers a wide range of topics, from male circumcision, through royal portraiture, to sewerage systems. Martinez’s lively and whimsical approach entices and tantalizes the reader’s interest and curiosity in aspects of blue-blooded lineage, consideration of which might never before have entered the person’s mind. As Martinez states, “I’m never more satisfied than when I’ve ‘converted’ someone from a passive or disinterested observer of history into an inquisitive and involved participant in the past.” Martinez’s imaginative and empathic insights into the peccadilloes and eccentricities of those of royal lineage bring the past to life in a relaxed, offbeat way that is a far cry from the conventional retelling of the past. In her discussion of how the monarchy has changed over the years, she reveals what she truly thinks regarding its relevance to the modern day. Her background in PR enables her to explore the public face of various European monarchies, as it has evolved over the centuries. Many of the topics that she covers have had wide-ranging implications for the dynasties of yore, and have repercussions that stretch even into today. From the divine healing powers of kings, to such longstanding legislation as the Act of Settlement of 1701 and The Royal Marriages Act of 1772, she shows how the behavior of those in power impacted on all strata of society. Martinez’s lack of bias regarding the religious aspects of history is reflected in her own life, as she is a Protestant who is married to a Catholic. Martinez’s essentially generous and nonjudgmental nature has enabled her to produce a work that is relevant and fascinating, and which should appeal to a wide range of readers, from youngsters seeking escape from what some perceive to be the almost inevitable boredom of the history classroom, through keen followers of the paparazzi, to older adults who love to reminisce about the past. An Unusual Journey through Royal History should prove to be a valuable addition to all school and college libraries, as well as relaxing, yet informative, reading for any private collection. I like the way that Martinez approaching "royal-gazing," incorporating lots of trivia and facts that connect with the everyday lives of many readers. While it was fun to read, there was nothing inspiring or life-altering to be found between the pages, and now that it is several months later, I don't have a lot of memories of any specifics from the book. Easy readingjust when I thought there was nothing new that could be said, this little book came along and surprised me. Victoria Martinez - Victoria (Tori) V. Martínez researches and writes about history while living and traveling around the world with her husband David and two children. Tori, an American, likes to joke that she only married David, a Spaniard she met in England, because his knowledge of seven languages helps her immensely in her historical research.Tori earned her undergraduate degree in Mass Communications from Texas Woman's University and her graduate degree in Applied Technology, Training and Development from The University of North Texas. After working in the corporate world as a public relations professional, Tori realized her passion for writing about history was what made her happy, so she packed up her life in America and spent two years living abroad. Eventually, she retired completely from her public relations work and now spends her time researching, writing and raising her two children.Her historical writing has been published online at sites like the Unofficial Royalty website (unofficialroyalty) and TimeTravel-Britain, and in print journals such as The European Royal History Journal, Royalty Digest Quarterly and The Duke and Duchess of Windsor Society Quarterly. She also served as a historical consultant for the BBC Radio 4 Saturday Play, “The Windsor Jewels,” a subject she has written about extensively.Her first book, “An Unusual Journey Through Royal History, Volume I,” was published in April 2011, followed in June 2011 by “The Royal W.E. Unique Glimpses of The Duke and Duchess of Windsor.” Her third book, “An Unusual Journey Through Royal History, Volume II,” was published in November 2011. A combined print book of both volumes of “An Unusual Journey Through Royal History” was published in January 2012.